The Italian region of Liguria borders France, Piedmont and Tuscany. The coastline is the same as that of the exclusive French Riviera and offers similar benefits; beautiful cliffs, beach areas, fishing seaports, a maritime economy and water-sporting activities. Liguria has been popular with tourists and locals for decades. Liguria is also one of the smallest of the Italian regions, it is densely populated and relatively prosperous economically. Genoa is the capital of Liguria, a large seaport with heavy cargo and cruise ship traffic – more details on Genoa can be found in a previous post. The famous Cinque Terre is also a large attraction for the region. What about the rest of this region? Ginger and Nutmeg spent one night in Garlenda, a tiny village in the hilly countryside. 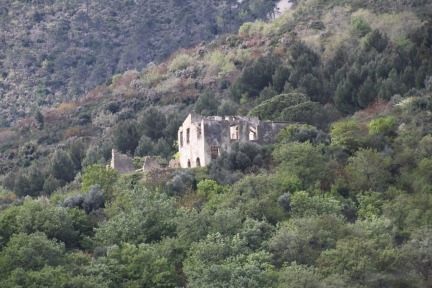 Garlenda is only a few kilometers off the coastal autostrada surrounded by the lush Mediterranean wilderness. The Liguria coastal area has been occupied for eons, written records confirm human inhabitants as far back as the first millennium B.C., and there are even prior traces of Neanderthal and Cro-Magnon men. There are two larger towns Albenga and Alassio both located on the coast, within 15 minutes driving from Garlenda. Albenga is an ancient Roman town, although it has little tourist “curb-appeal”, as it was always a fishing and commercial town. 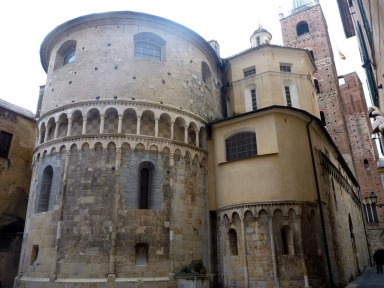 Albenga reached its’ pinnacle in the Middle Ages as one of the most powerful cities in the region. Flooding in the 13th century changed the course of the river and eliminated Albenga’s Roman port. The town is now a significant commercial centre for cultivation of vegetables and flowers, green houses and nurseries line the roads as you approach the city. The historic centre is worth a visit as it is well preserved with a large cathedral, impressive bell-tower and baptistery. Albenga is supposedly the sister city to San Gimignano in Tuscany. Nutmeg finds that comparison a bit of a stretch. However, it is worth a visit, and you are guaranteed to have nothing like the crowds that throng San Gimignano. 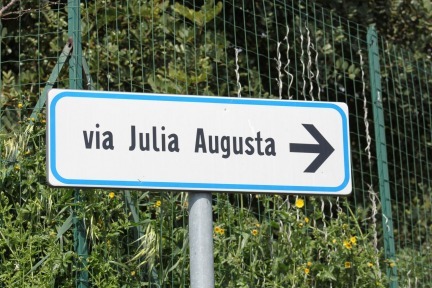 Just outside the town of Albenga you can walk the Via Julia Augusta and see some Roman ruins along your way. 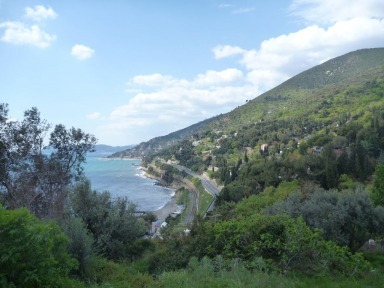 This coastal trail is about 6 km long and will eventually lead you to Alassio along a route that skirts residences, beautiful gardens and olive groves. The problem is the trail is poorly marked (this is the only sign); G&N had a couple false turns along the way so did not complete the walk. The town of Alassio is a popular seaside resort. It has all the trappings of other holiday destinations, shopping, restaurants and family activities. Ginger and Nutmeg now realize that they had a hurried visit to an area that is hardly “off the beaten path”. This coastline is popular for all the right reasons, and a return trip is in order to sample more of the fabulous local cuisine including the olives and pesto. You can see more photos in our Italy: La Dolce Vita Gallery. I would like to visit the area. Hi SJK You should plan to, you would love it. Let’s work on him, you would both enjoy the Ligurian coastline.